TechWeb and CNET’s Webware bring us some great coverage of some of the discussions at the just-ended Web 2.0 Summit. On one panel, Democratic campaign organizer Joe Trippi noted that official Barack Obama campaign videos on YouTube garnered over 14.5 million hours of viewing, which would be the equivalent of paying for $47 million of advertising time on broadcast television. Over 90 minutes of videos on Webware (broken into segments) include Al Gore, San Francisco Mayor Gavin Newsom, and PayPal and Tesla Motors founder Elon Musk. GiantBomb relaunched Monday, blossoming from a simple video game blog into a full-featured wiki-style site with user-powered content already adding loads of content to the underlying relational database. Alongside the member content are videos, reviews, and podcasts from the small team of mostly ex-Gamespot and -CNETers (you may have heard about Jeff Gerstmann's unceremonious firing from Gamespot last year). 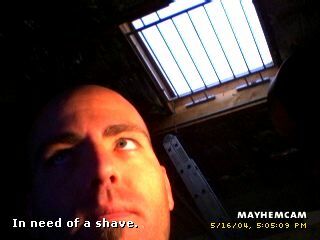 I spent a few hours perusing the site today, mostly watching the videos. They've come a long way since the March soft launch, and the new site boasts magnitudes more features; it's going to be exciting to watch how it progresses, and I'm not even a gamer. To give you an idea of how powerful the platform is, and how well the user experience has been thought out, watch this how-to video from their Help section. Awesome spot from We Can Solve It. Make your own with painted paper and hot glue. Former Yahoo Bill Scott (he's now with Netflix) gave this talk at CNET about a year ago, but I was glad to watch this video again for a refresh. If you're a web developer or user experience designer, it’s chock-full o’ really good things for for you to know. His personal website is very, very useful too, and if you're not already aware of and using the YUI Interface Library, it's a must-see. Now that I've watched this awesome instructional video, I'll be prepared to visit Japan! lol! I like this comment: "Add baking to the list of typical hobbies for gay, white, disco ninjas." When you truly (euphemism for attraction) someone, nothing says it like a form letter. My pal Aaron Newton launched his new site a little over a week ago, and it's garnering some good reviews. It's a social-web aggregator allowing you to keep track of you and your friends' activity on a bunch of services like Yelp, Digg, Twitter, and YouTube, but do it all in one place. I helped Aaron a bit with some graphic advice early on. I don't know how to describe these webisodes. They're just funny. You might recognize Michael Cera from Juno or "Arrested Development." You gotta start at Episode 1 though. 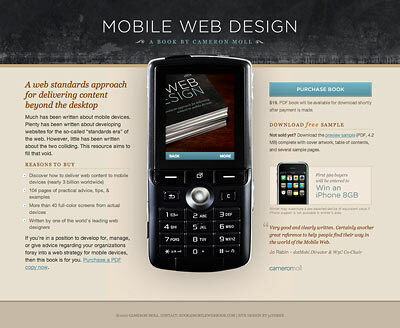 Cameron Moll has published a new book titled Mobile Web Design. I don’t have it yet, but based on his previous work I'd bet it's pretty good. Despite the name, this book is not just for designers. You may want to check it out if you are in any way part of the development of content for mobile devices. There's a general dearth of info available on mobile web development, so it's probably a good addition to your library. It’s only available as a PDF download now, and I’m not sure if it’s going to bookstores and Amazon later or what, but I’d be willing to bet it will. However, you can get it cheaper as a PDF now ($19), and the first 599 buyers will entered in a drawing to win an iPhone. There’s a sample preview available too. UPDATE: There's also a new article today on A List Apart on mobile web design in the new age of the iPhone and Mobile Safari. Really well done online photo editor that works with your Flickr account, uploaded photos, photos on the web, or pretty much anything. Now this looks like a fun place to work. I really want one of these cat scratchers but there's no way I'm gonna pay $84 for a chunk of corrugated cardboard. This is a really interesting (and slightly disturbing) animation of the Little Red Riding Hood story in Russian (I think) with incredible subtitle translations ("Forest is truly blood-hungry and life-jealous, and violence") and even more incredible commercial breaks (in Japanese!). This is a really cool Flash animation based on a Coltrane song. Some of you, my faithful readers, will love this video. Others of you will think it's more boring tech stuff, and you'll skip it. But it applies to all of you, whether you realize it or not. And that's why some of you will love this video.